orthodontia care and confidence that comes from having a camera-ready smile. appointments for Smile for a Lifetime going through their office. for free braces. DiCicco said the kids the board chooses are often very inspirational. one of my favorite places to go. When my mom says it’s time for my appointment I get excited. and other procedures that sometimes have to be done in order to facilitate braces. community party, which was held outside the DiCicco Orthodontics office on Monday, Oct. 26. Free Kona snow cones were given to families and friends in attendance. Congratulations to our Board President Dr. W. Ronald Redmond who was presented the Eugene and Pauline Blair AAOF Distinguished Service Award during this year’s AAO national conference by the AAO Foundation. Dr. Robert Bray, former AAOpresident/current S4L member, presented the award. Thank you, Dr. Redmond for all you do in serving others! S4L is proud to have you serve as our Board President. Special thanks to the AAO for use of the photo --- Dr. Redmond (left), Dr. Robert Bray (right). Smile for a Lifetime scholarship recipient Bree Smentkowski saw her new smile for the first time after two years of wearing braces at Boulton Orthodontics on Tuesday. The Smile for a Lifetime Foundation is a non-profit organization that provides free orthodontic treatment to individuals aged 11-18 who demonstrate financial need. “I was nervous that it would be a lot of work to take care of the braces and it would be difficult and unusual, but everything’s been better than I actually thought it would be,” said Bree Smentkowski, 15. When the process was complete, Bree Smentkowski not only had a new smile but a new attitude. “I feel definitely more confident now with my new teeth and more confident in myself with being able to talk to people about it,” Bree Smentkowski said. Bree Smentkowski’s new smile yielded not only surprise from her but an emotional reaction from her mother. Scholarship recipients are selected by a panel of board members based on the strength of their application form, essay question answers, and letters of recommendation. “Orthodontic treatment depends largely on patient compliance and so it’s a nice tool to help to see if we’re going to be helping these kids because if it goes bad, then we could be doing more harm than good,” said Dr. Bart R. Boulton of Boulton Orthodontics. As a Cypress resident since childhood, Boulton feels that giving back to the community is important, and his office has been a part of Smile for a Lifetime for three years. Though Smile for a Lifetime has over 100 chapters all across North America, what’s unique about Orange County’s chapter is that it’s run through its corporate sponsor Ormco, an OC-based company that manufactures the brackets and wires the patients use. With the help of Ormco, Smile for a Lifetime’s Orange County chapter can give young people with financial need more beautiful and healthier smiles. The foundation not only ensures that its patients smile for a lifetime but that they make their communities smile as well. “Our philosophy is a pay it forward philosophy so often times those recipients of orthodontic treatment pay it forward by doing community service projects in their local community,” Lewis said. For more information about the Smile for a Lifetime scholarship, visit www.ocs4l.org. A new Smile for a Lifetime chapter opens in Dalton, GA! Dr. Soni awards his first of at least six scholarships per year to Daylon Smith! Dr. Soni from Soni Orthodontics in Dalton, Georgia has a passion for his work and his community. Recently, when presented with the idea of awarding orthodontic scholarships (braces at no cost) through the Smile for a Lifetime (S4L) Foundation, he quickly started his own local chapter with a mission to change lives and empower youth through the gift of a smile. 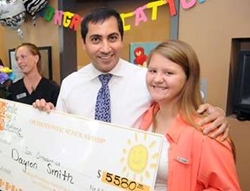 His local S4L board of directors selected Katy “Daylon” Smith as their first scholarship recipient on August 1st, 2014. Daylon is fourteen years old and enjoys singing and playing the piano. Her father and four sisters love spending time together, especially outdoors. She also has a passion for agriculture and has been a part of Future Farmers of America since middle school. Her dream is to become an agricultural educator. When she applied her father knew that improving her smile would also improve her "self-esteem and success in the future." As a condition of receiving the scholarship, Daylon will be volunteering in her community through FFA. Dr. Soni will be addressing issues with her gap, overcrowding and overbite but when the braces come off, the self-confidence created will remain and ultimately change her young life forever. No longer will the minor imperfections leave her embarrassed and reluctant to smile or afraid to participate in group settings. Dr. Barbara Hershey and Dr. Gavin Heymann are pleased to announce the initial application period for “Smile for a Lifetime” (S4L) scholarships through the new Smile for a Lifetime – Chapel Hill Chapter in North Carolina. The S4L – Chapel Hill Chapter is committed to offering 6 scholarships annually for comprehensive orthodontic care (free braces) to children in Chapel Hill, North Carolina and the surrounding communities (Orange & Chatham Counties) who otherwise might not be able to afford orthodontic care. 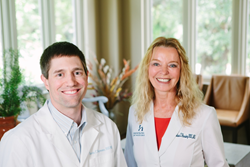 Dr. Barbara Hershey and Dr. Gavin Heymann have agreed to be the orthodontic providers for this Chapter. Scholarship recipients are chosen by an independent Board of Directors (names included on the webpage). Serving Durham, Chapel Hill and surrounding communities for over 30 years, Dr. Hershey & Dr. Heymann are proud to start this new chapter of Smile for a Lifetime in North Carolina to serve underprivileged children in their area. Please help them get the word out! They are seeking applicants to award these 6 scholarships to in 2015!